Arrive late night at New Delhi International airport. On arrival in Delhi, Grand Tours India Representatives will greet you and your family. Then you will be escorted to the hotel. Overnight stay will be at hotel. After hearty breakfast in this morning, enjoy sightseeing tour of Old Delhi. Former centre of Mughul Power, Old Delhi offers ancient monuments, narrow streets and bustling bazaars. Visit the vast and splendid Red Fort, built in 1648, the Jama Masjid - the greatest mosque in India and completed in 1658 by Shah Jahan who also built the Taj Mahal, and the Raj Ghat, the simple memorial to Mahatma Gandhi. In the afternoon, enjoy sightseeing tour of New Delhi. New Delhi - drive past the stately government buildings of the British Era designed by Lutyens, including the India Gate & the Presidential Palace. Continue onto the beautiful Humayuns tomb & predecessor of the world famous Taj Mahal. 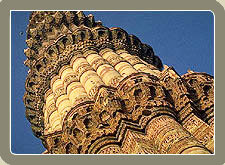 End the tour at the towering minaret of Qutab Minar. Dinner and overnight stay will be at hotel. After a leisurely breakfast, you will be assisted to drive to Agra (203 km / 4 hours). Upon arrival in Agra, Grand Tours India Representatives will assist you to transfer to the hotel. Late afternoon visit Taj Mahal. This white marble memorial built by Shah Jahan for his beautiful wife... Little needs to be said about this architectural wonder which is always the soul raison-de-etre for every tourist's visit to Agra. This monument took 22 years to be completed and was designed and planned by Persian architect Ustad Isa. Apart from its stunning design balance and perfect symmetry, the Taj is also noted particularly for its elegant domes, intricately carved screens and some of the best inlay work ever seen. The guest will stay at the Taj Mahal till sunset to see this true wonder of the world in gentle late afternoon light. Dinner and overnight stay will be at hotel. 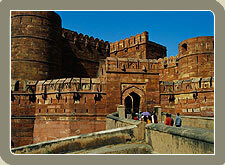 After hearty breakfast visit the Red Fort and drive to Samode visiting en route Fatehpur Sikri. Upon arrival at Samode, Grand Tours India Representatives will assist you to transfer to the hotel. Dinner and overnight stay will be at hotel. Red Fort : lies on the bend of the river Yamuna, almost in the heart of the town. Akbar built it as his citadel over the years 1563-73 in the finest architectural style. It has imposing gates and walls of red sandstone and a moat. Drive to Samode en route visit Fatehpur Sikri. Fatehpur Sikri : Visit at impressive sandstone fortress of Fatehpur Sikri. The fort was built in the 16th century and only occupied for a few years before being abandoned, leaving the buildings in virtually perfect conditions. Samode : The small principality of Samode lies 50 km northwest of the city of Jaipur and dates back to the 16th Century. The 7th ruler of Amber, the ancient capital of the Rajput Empire, had twelve sons, one of whom was awarded the feudatory seat of Samode for his gallantry and outstanding service. The construction of the fort began 400 years ago and each successive ruler added to the fort and the palace. After hearty breakfast in the morning, explore the surroundings of Samode villages. Later drive to Jaipur. 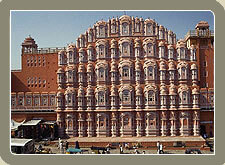 Upon arrival in Jaipur, grand Tours India Representatives will assist you to transfer to hotel. In the afternoon enjoy city tour of Jaipur. Dinner and overnight stay will be at hotel. Tour of the Pink City : Surrounded on three sides by the rocky Aravali hills, Jaipur is the picturesque capital of Rajasthan. It takes its name from the prince, soldier and astronomer Jai Singh II who moved his capital here in 1727. Jaipur is notable for its distinctive pink-orange coloring. The whole of the old city, including many fine palaces and buildings, was constructed from solid blocks of Sandstone or faced with the same stone. But it was only in 1853 that it gained its famous title, the "Pink City"- it was painted pink for the first time in honour of a visit from Prince Albert. You will also visit the 'Hawa Mahal' , the open air Jantar Mantar Observatory to see the vast astronomical instruments. Enjoy a stroll through the colorful bazaar before returning to your hotel. After hearty breakfast, enjoy the tour of Amber Fort. Tour of the impressive Amber Fort, situated on a ridge just outside Jaipur City. At the foot of the hill you will mount your caparisoned elephant for the slow but steady climb up to the main gate, making your entrance in the time honoured fashion. The Fort, completed in the early 18th century, took over 100 years to build and now, although deserted, offers a fascinating insight into the lifestyle of the Mughul ruling families. Spend rest of the day at leisure. Dinner and overnight stay will be at hotel. This morning you will be transferred to the Airport for flight Jaipur/Udaipur. Upon arrival at Udaipur, Grand Tours India Representatives will assist you to transfer to hotel. Late afternoon boat cruise on Lake Pi chola. Enjoy a boat cruise on Lake Pichola at sunset visiting the Jagmandir Island - in the middle of the romantic Lake Pichola. It commands a superb view of the City Palace, Lake Palace and Sajjangarh Fort, on its own island, and it is where Prince Khurram was given refuge in the 17th century. Dinner and overnight stay will be at hotel. After hearty breakfast, enjoy the city tour of Udaipur. City tour of Udaipur : The romantic Lake City in Southern Rajasthan, famous for the stunning white marble Palace built on an island in the Lake Pichola. It was the former Palace of the Maharana and now converted to one of the most glamorous hotels in India. The tour will cover the magnificent City Palace, the Jagdish temple, and a drive around the other nearby lakes. then continue on to the Garden of Maidens "Sahelion-ki-bari' and the Folk Art Museum& paintings. In the afternoon you are free for your own activities and to enjoy the facilities at the hotel. Dinner and overnight stay will be at hotel. After hearty breakfast in the morning, you will be transferred to the airport for fight Udaipur / Delhi. Upon arrival in Delhi, Grand Tours India Representatives will assist you to transfer to the hotel. Spend rest of the day at leisure. Dinner and overnight stay will be at hotel. Today you will be transferred from hotel to the airport to catch flight for home destination with carrying sweet memory of Exotic Rajasthan. Copyright © 2013 Grand Tours India. All rights reserved.